Gentlemen, don't get suckered into months and months of growing your hair out. Just buy this seriously legit Groupon to order your clip in Man Bun,and then viola, you're just as trendy as everyone else. Oh, and the belly? Just change your diet to nothing but Paula Deen endorsed recipes. I Apple the Big Love NYC! 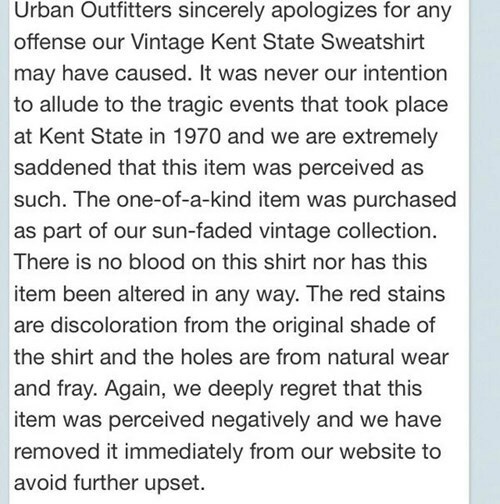 Though the shirt has been removed from their site (or sold out), Urban Outfitters got into hot water this weekend for this stained and damaged "vintage" Kent State sweater. The historically-minded among you will recognize Kent State as the site of a Vietnam War protest in 1970 that ended with the police shooting of four student protesters. TL;DR: Company known for ripping off art designs, pandering to bratty youths, and doing attention-grabbing things to gain publicity among other attention-grabbing bratty youths acts according to form. Carry on. What is This, an Ad for Mutants? There's always more questionable fashion choices over at Poorly Dressed! And yet, the shirt is still sold out. Don't mind me, I'll just be on my spaceship, taking off from this planet.